Transfer from Wichita State Univ. Selected by Indiana Pacers in 2nd round (#26 pick overall) of 1986 NBA Draft. An imposing center on the Kansas University team from 1984 to 1986 was the 7-foot-1 graduate of Wichita’s Kapaun Mt. Carmel High School. He helped lead KU to the Final Four in 1986, then played 10 years in the NBA, seven with the Indiana Pacers, who drafted him in the second round. 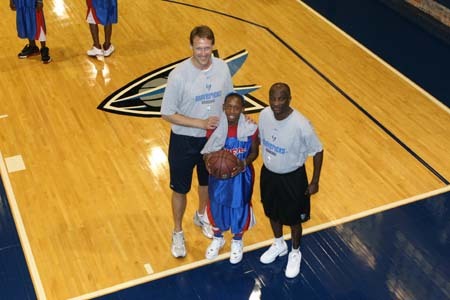 He later played with the Dallas Mavericks. In 1985, he was KU’s MVP and was selected for the World University Games U. S. squad. He scored 1,209 points and grabbed 650 rebounds in three years at KU. His 57.2 shooting percentage ranks No. 5 on KU’s all-time list. He also blocked 138 shots. Dreiling first signed with Wichita State but transferred to KU after his freshman season. 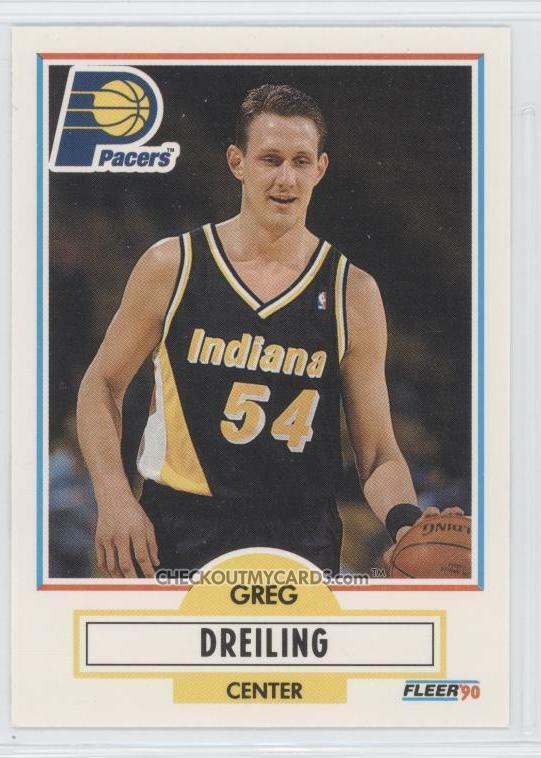 Greg Dreiling, the starting center from the potent 1986 team that lost to Duke in the semifinals of the Final Four in Dallas, doesn't much care to look back on the game that ended the season of one of the best teams in KU history. "I've got the film, but I still haven't watched it," said Dreiling, who currently lives in Dallas while recovering from an Achilles injury that has curtailed a 10-year NBA career. "That season was a nice ride, but it had a tough ending." 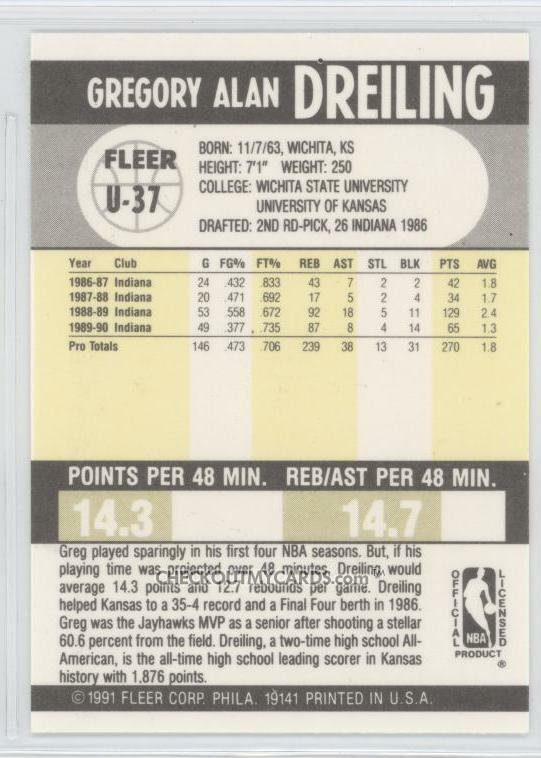 Fearing he might be bad luck for his alma mater, Dreiling didn't attend the 1988 NCAA Championship game in Kansas City, even though his Indiana Pacers teammate, Oklahoma alum Wayman Tisdale, was up for attending the OU-KU matchup. "He went to the game, but I stayed home not wanting to be a jinx," Dreiling explained. "Maybe he was a jinx for them." People have long speculated that had college basketball had a 3-point shot in 1986, the Jayhawk team that featured bombers Ron Kellogg and Calvin Thompson might also have been in the finals. But Dreiling jokingly says he isn't sure he would like to play on such a team. "With the way they liked to shoot out there, I'd have never gotten the ball," he cracked.